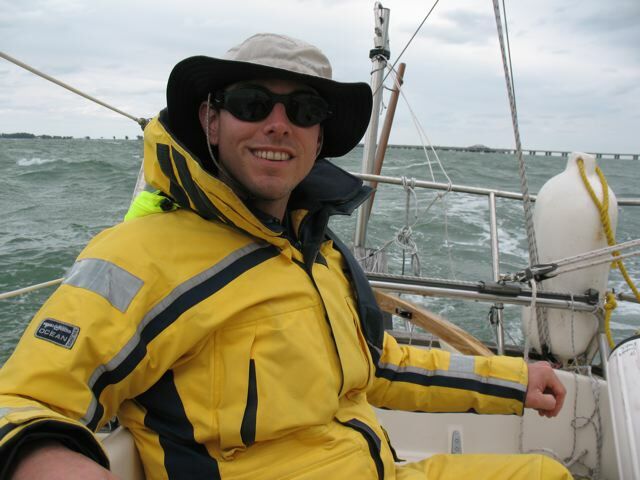 This is primarily a sailing blog written by someone who loves small, simple boats. Here you will find stories about sailing and travel on a small budget. My name is Barry. I started this blog as a way to connect with others who are passionate about cruising sailboats. I am on a voyage which began in earnest when I left Chadwick Bay Marina in Dunkirk, NY in October of 2010 on my 25 foot, 6 inch long sailboat Cavendysh, a Contessa 26, with the goal of sailing south for the winter. Sailing is the one thing I keep gravitating back to in my life. I began sailing somewhere around age 5 on small boats. My formal education is in marine engineering, though I worked in other fields for most of my professional career. After 6 years working in a pharmaceutical plant I wanted to get back to the sea, and did so by sailing on the Amistad as engineer. Next, I tried working on private sailing yachts, but found that they took me farther from the type of sailing I was interested in. I decided to try setting out for myself in a small boat. I chose the Contessa 26 initially because I wanted to live and travel as simply as possible. It seemed that the best way to travel simply was to go for the smallest boat that had the seaworthiness required to sail anywhere. I was only planning to live and travel on the boat for a year or so, but by the end of the first year I found that I wanted to continue the voyage in a way that was more sustainable. That meant that I needed enough space to carry tools for working on my boat and others (for income), and also to be able to invite guests. So, I continued on the slightly larger Sirocco for the next year. We migrated up and down the east coast of the US. Life on board was much more comfortable (and dry!) than it had been on the Contessa, so I pushed farther out of the usual sailing seasons and off the beaten path. Late-season sailing in New England made me begin to think about voyaging even farther north–to places that would require cabin heat and more self-sufficiency. I decided that I didn’t want to change the lovely Sirocco in ways that would make her more suitable for far-north voyaging. I wanted a flush cockpit among other things. That is what led me to the worn old Dreadnaught 32 that I found collecting water and growing mold in the back of a boatyard. She was unlovely and all her gear thoroughly worn out, but I thought to myself that here was a boat I could finally change to suit my needs without worry–any changes will be improvements! I hope to share my experiences here and also onboard the boat with people who I meet along the way with the goal of introducing more people to the joys of simple voyaging under sail. This voyage started on a whim, but was born of a wanderlust with deep roots. Please contact me if you have any questions at all. Thank you for giving us the name of Sirocco’s new owners. Keith and Kyle have talked on the phone and we hope to go up to see her again one day. It’s amazing that after all these years and all the miles under her keel that she now resides about 50 miles from where she was launched. I truly regret that we didn’t discover your blog while you still owned her. For 26 years we drove up to Maine every summer. It would have been so easy to make a side trip to meet you. Oh well, i’m very happy to have found you while surfing round the net. I have read your entire blog from start to finish, but especially loved reading the years you wrote about Sirocco. We never knew what happened to her after we sold her to Ray. We feared the worst, but were very happy that you bought her. She looks lovely in the photos and videos. Best wishes to you and your IdleQueen project. Fondest regards, Cindy Falstrom. Hey Barry, just creeping your website. How are you?! Drop me an email sometime buddy. as-tu progressé pour tes travaux sur Idle Queen, particulièrement sur la coque extérieure ? Bon courage de toutes façons. Salut Cinthia et Francis! Je fais de bons progrès, mais pas beaucoup sur la coque extérieure récemment. Ce sera bientôt. Il est préférable qu’il a plus de temps à sécher en tout cas… Merci beaucoup! hey when are you comming up? Hey Mya–I’m not sure… I might just head south from here, but I’ll let you know when I know! “Ave Maria” in Aug. of 2012. She is a ketch rig with 30 hp Janmar engine. This boat is in pretty good shape. We are docked in Baltimore, MD. We like the way the boat has performed so far in some fairly rough weather. So far we have only slept on the boat 3 night, but expect to do a lot of sailing this summer with a friend who has a Westsail 32. I have been sailing on the bay for 4o years, the last 30 in a Morgan 32 – 1967. What brand of self-steering windvane did you use on the Contessa? Would there be room for an outboard bracket for a 6hp outboard? (no inboard diesel on my Contessa). I am replying in more detail by e-mail, but the quick answers are that I was using a Cape Horn steering vane, and that there was physically still enough room on the transom to mount an outboard bracket beside the steering vane supports.